There is a 5x5 RGB LED matrix in the center of the webduino Bit board. Each LED has R,G,B colors to blend to give different colors. Pictures can be displayed by combination of different colors at different positions. All the blocks relate to development board are in the development board menu. 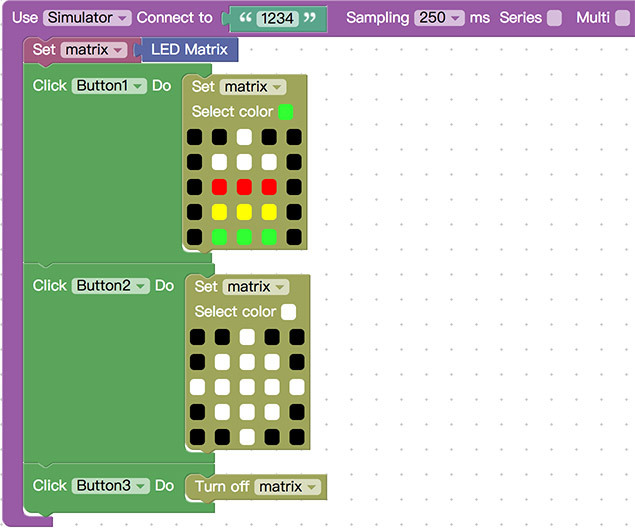 Place the block of matrix setup to development board, and then put the block of matrix color setup block below it. Use mouse to choose color first, and then click in the matrix to set the color to the LED, black color means the LED will switch off. Click the red button to run, the preset color and picture will be displayed on either the physical development board or the virtual board in the simulator. Having been familiar with full matrix basic use,the next is to use web control button in web interactive area to control the matrix on the board. 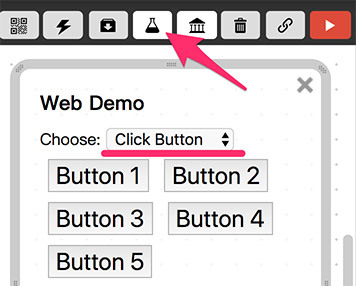 Choose the web interactive button on the top and click button action, there are 5 buttons will display and corresponding block will be available on the left. Place the “click button..run” blocks to the edit area and set button1 and button2 to display different pictures, and set button3 to turn off full matrix. Press the red button on the upper right to run, user can use buttons in the web interactive area to control colors and pictures either on your physical Bit board or the virtual board in simulator.